Although county, state and federal recreation areas might have different park rules and regulations, those posted by the State of Georgia and the US Army Corps of Engineers (USACE) at Lake Allatoona will be helpful to everyone. For detailed information about a particular spot, select it from those listed in our Parks or Campgrounds around Allatoona. 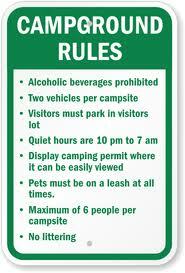 Park rules and regulations are posted at each individual location. For everyone’s peace and safety, they must be observed by all guests and their visitors. Here are some specific guidelines. Pets accompanied by their owner at all times and on leashes no longer than six feet are welcome at state parks and campgrounds. Kennels are not available. Owners must clean up after their pets. Pets are allowed only in select cottages with advance reservations and a fee. Pets, however, are not allowed in or around historic sites, lodges, group camps, swimming areas or some trails. Check with specific sites for details. All campfires must be kept in designated areas, such as a fire ring. Never leave a campfire unattended. S’mores always taste better when marshmallows are toasted over hot coals, not bonfires. When the danger of forest fires is high, even campfires might be banned. Firearms — except those that are unloaded, cased and stored — are not permitted on US Army Corps of Engineers property, except for possession of a firearm by law enforcement officers, and by hunters and fishermen participating in programs managed through local lake offices. State laws authorizing licensed concealed and open carry of firearms do not apply to Corps offices, campgrounds, day use areas, wildlife/hunting areas, or any area managed by USACE. Please leave wildflowers for other visitors to enjoy. All wildlife, plant life, driftwood, artifacts and any other natural or man-made items are protected. They may not be disturbed or removed. The use of metal detecting equipment is allowed in some locations, under certain guidelines. Recreational gold panning is allowed at Allatoona. “Prospecting” is not allowed. Pans and small shovels can be used “in creek beds only from the Government property line to the normal summer shoreline.” Digging in sides of creek banks is prohibited. Sluice boxes, rockers, dredges and the use of chemicals are not allowed. Park roads are public roads. ATVs are not allowed in state parks. All vehicles are subject to license and safety requirements and regulations of the Georgia Department of Public Safety. Please be considerate of guests who are sharing parks with you. To ensure everyone enjoys a quiet, natural experience, radios, televisions, musical instruments and all other noise-making devices are prohibited between 10 p.m. and 7 a.m. They may be used at low volumes during other times. When you rent cottages, campsites and lodge rooms, you are welcome to have visitors. Please check with park offices for the number of visitors you are allowed. Visitors may stay until closing times. All group gatherings must conclude before 10 p.m.